Many people have questions concerning cooling towers and whether they need to tell their local council about them. Here, we look at how to register cooling towers and council notification; we also provide answers to some of the more common questions from owners and operators of towers and evaporative condensers that arise. Should you tell your local council if there is a cooling tower on your premises? Yes – You have a statutory duty under the Notification of Cooling Towers and Evaporative Condensers Regulations 1992, to notify your local authority in writing – this applies to all businesses, as well as to other premises that have cooling towers. The notification process also relates to evaporative condensers. The only exceptions to this rule are when the tower or condenser contains no water, or the water or electricity supply is disconnected. When should the registration notification be made? If you are planning on installing a cooling tower, you should tell your local council you are going to do this before you begin. It is also necessary to tell your council if a cooling tower is no longer going to be used, regardless of whether it is taken apart and removed or not. 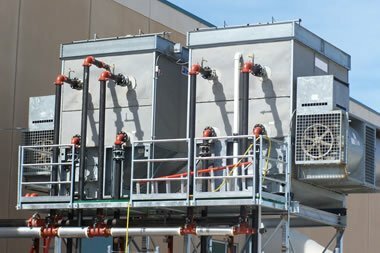 How easy is it to register cooling towers? There is an official form that must be completed to register cooling towers and submit your notification under the 1992 regulations. The Government and most council websites will have a copy you can complete and submit online. You can also download the form to print off, or ask for a copy to be sent to you. Is the tower registration process difficult to complete? It shouldn’t be – just make sure you fill in the entire form and give all the information required. You won’t pay anything to notify your council, and all notifications received are added to the register without any delay or need for approval. They cannot be declined, either. Can a cooling tower be inspected by the Health and Safety Executive (HSE)? Yes. Occasional inspections may occur to ensure the standards of upkeep and maintenance of a cooling tower (or evaporative condenser unit) are sufficient for safety purposes. This will also include a review of measures (and records) taken by you to control the risks associated with Legionella bacteria and Legionnaires’ disease. The first stage in this process is to carry-out a legionella risk assessment. Do you need to submit more information once the notification has been made? No – not unless there is a change in circumstances. For example, if a previously-active cooling tower is decommissioned, this must be notified to the council in writing. The notification process in this scenario must be completed within a month of that change. If there are no changes, there is nothing to do, since notification only needs to be done once (assuming there are no changes).